I’ve sent the design and instructions to all the participants who’ve registered. Hope you’ve received it. Please keep all the materials ready, print the document and trace the design which I’ve referred as tracing outline on to the cloth which you’ve prepared for the project . 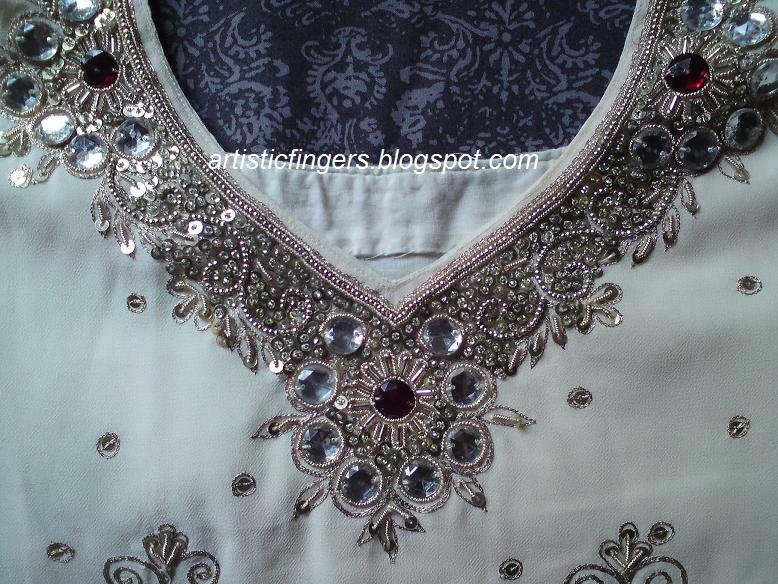 I’ve stitched this on my salwar kameez. 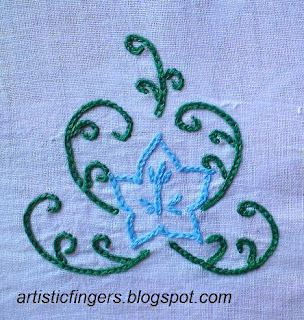 I’ve got to go….finish my stitching, only then I’ll have time to e-mail the designs to all the chikan embroidery SAL participants this weekend. It sounds like a movie title! But this post has got nothing about movies :-) .It’s about me…..
I’ve read all your e-mails, replied to some of you and yet to reply a few. Sorry about that, too many commitments . Some of you had shared a couple of interesting things with me, thank you. I’ve received some mails asking about my embroidery like when did I start learning, what form of embroidery I chose to learn first ,what do I do with my finished piece, will I post images of my first or earlier works etc. Those questions led to this post………. I don’t remember my first embroidery but I do remember my first crochet and knitting. 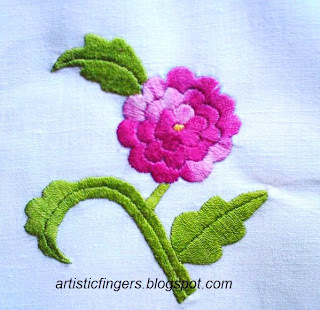 I asked my mom’ about that and she said that I was a little girl when I started my embroidery probably 4 or 5 years old. 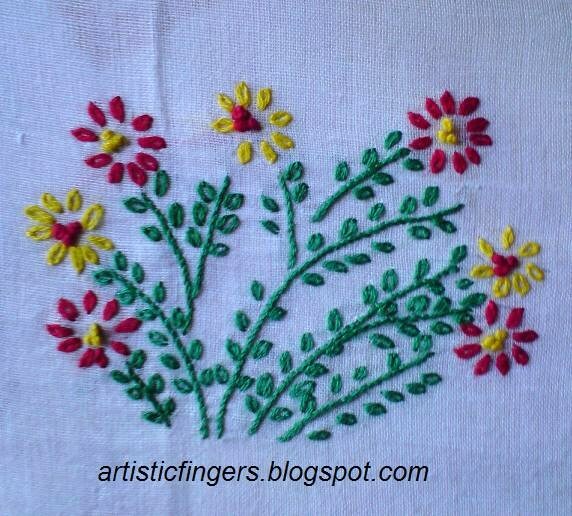 The first person who fell in love with embroidery in my family is my mom’. I used to sit and watch her stitching. 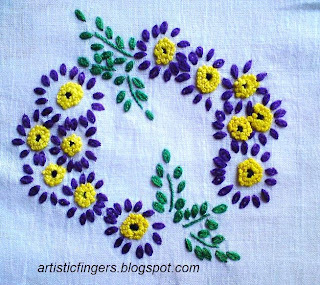 So one fine day my mom’ decided to give the needles to me and she held my hand ,made me stitch a chain…….I was taught free style embroidery first and later I moved to other styles which I remember. 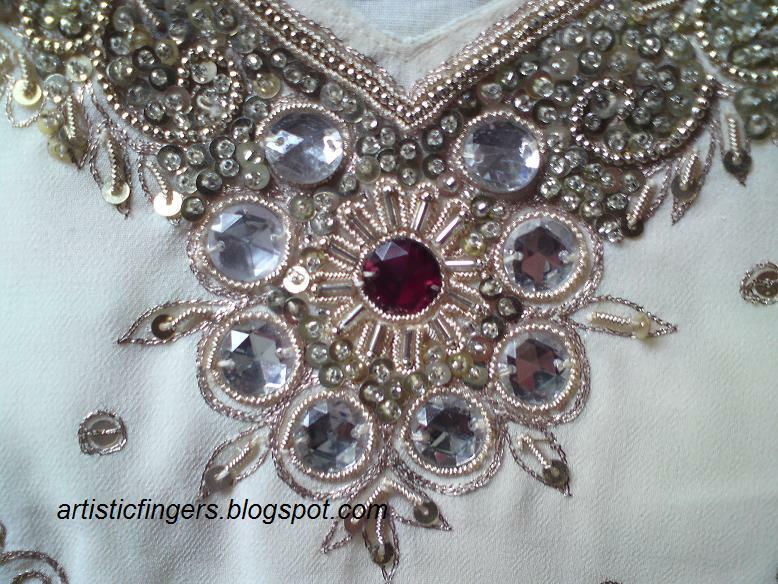 I’d framed some of my finished pieces, used some in a quilt, made bags , purses and kurtis , gifted some……. Let me show y’all some designs which I’d stitched in my pre-teen and early –teen years. 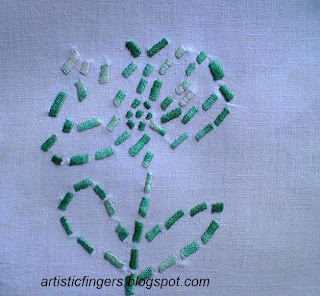 My mom’ is a strict teacher , she’d made me stitch a sampler for each stitch…. 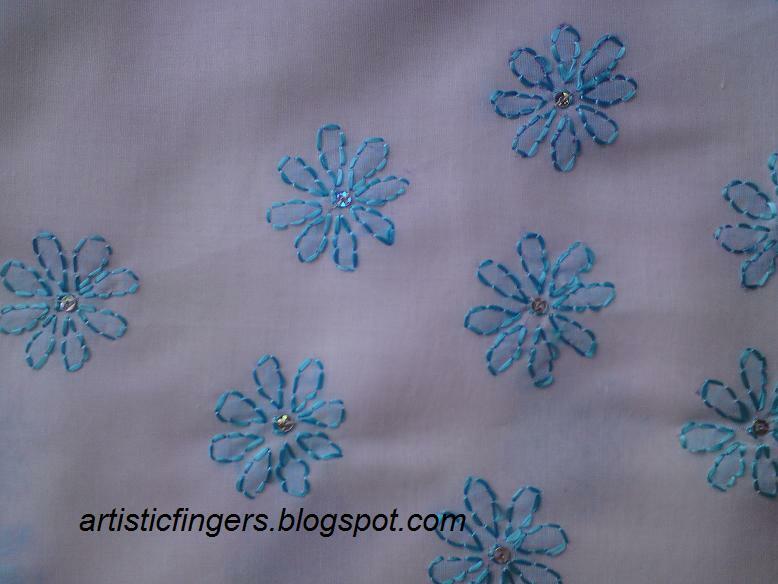 While writing this I remember all the criticism I’d got whenever I sat with my needle and thread. I was discouraged probably a million times and my mom’ received free advice from everyone including Mrs. X,Y and Z.I never bothered and continued learning…….May be I bothered, that’s why it’s still fresh in my memory. My stitching didn’t take a back seat even when I was in my college. 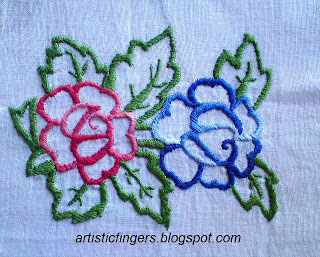 If I get a chance then I’d like to tell all those who’d made nasty comments about my passion that I may not be the best embroiderer in the world but I turned out to be a pretty decent one. Have you ever faced a situation like this? How did you handle that situation? 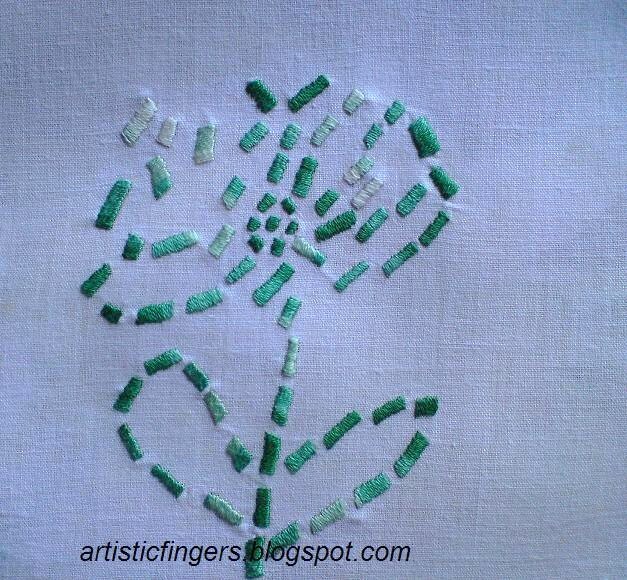 Happy stitching and have a happy weekend wherever you are ! I’ve sent the class supplies list to those who’ve signed up. Chikan embroidery SAL is almost full. I’ve sent an e-mail to everyone to confirm their place in the class.If you didn’t get it,then please do remind me. 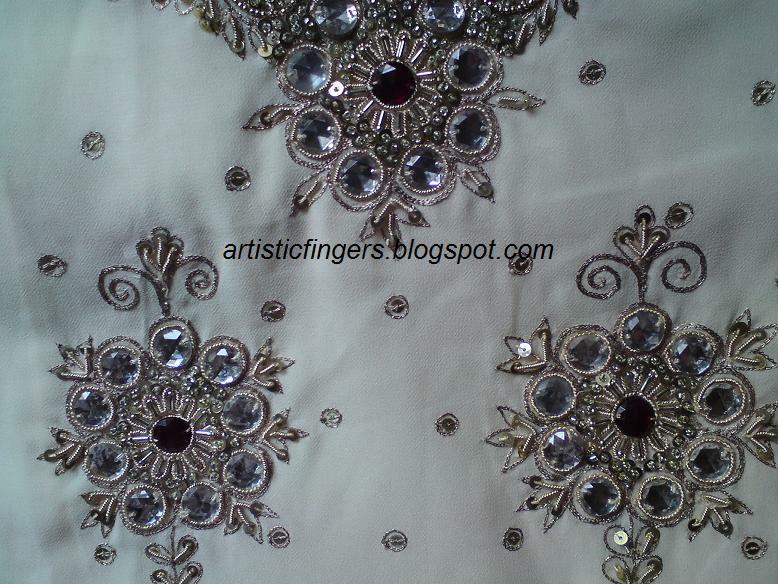 I’ll be closing down the registrations by 11th February 2012 Indian standard time 10AM. Please don’t leave your e-mail id in the comments form.If you want to participate then do send an e-mail to me . Thank you all for your support and wishes. I thought it’ll be useful for others too if I answer all your questions in a blog post . 1.I do surface embroidery,but am not familiar with Indian embroidery.Can I join this class? 2.I don’t live in India.Can I join this class? 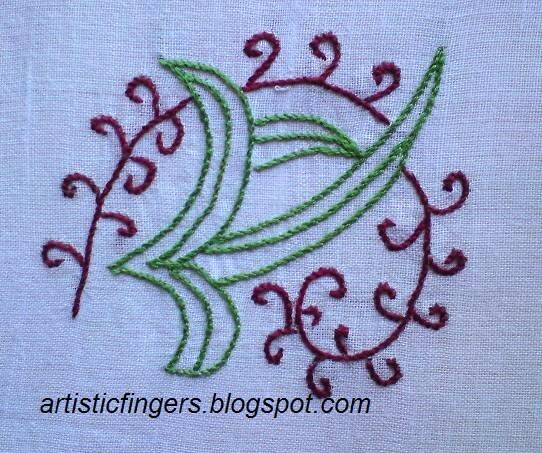 3.Is this course designed for a beginner,intermediate or advance level stitchers? 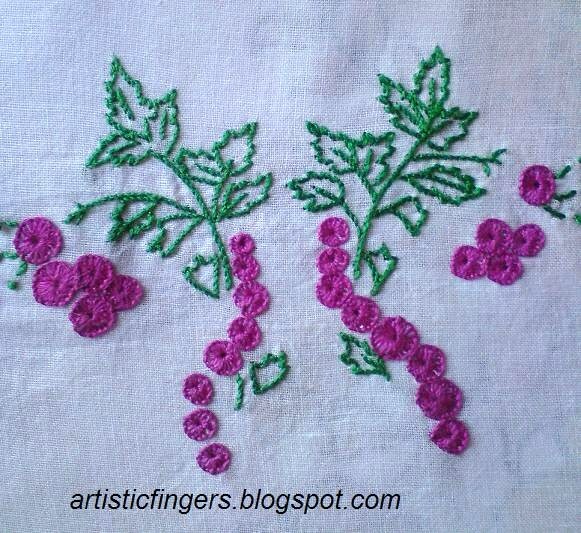 form of embroidery is ok.
4.I can read English,but am not fluent.Is it possible for me to follow this class? you find any lesson difficult. 5.What is the duration of this course? 6.Do I have to buy a kit from you or ship any material from India? No.You neither have to buy a kit,nor ship anything from India. 7.Where do I buy the design? I’ll send the design to you via e-mail. 8.How do I register for this class? and country where you live .If you are in India please do include your city,town……. 9.How much does it cost? It’s free.you don’t have to pay me for the classes. 10.I’ve sent you a mail already,will you confirm my place in the class? Yes.you’ll receive a confirmation e-mail. 11.When will you send me the material list? 12.Can I post my progress in my blog? 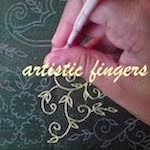 Yes,you can post your progress in your blog .Please link back if you do . 13.When does the course start? First week of March.I’ll post the exact date as soon as the registrations are over. 14.How often will you post a lesson? Once a week in my blog. 15.What will happen if I miss a lesson or two? No problem.The lesson will be there in my blog,you can come back and continue. 16.I’d like to get your feedback.Will you give feedback and what do I have to do? I think I’ve answered all the questions which I’ve received so far.If you want any information regarding this class please leave a comment or send an e-mail.I’ll try to clarify your doubts. 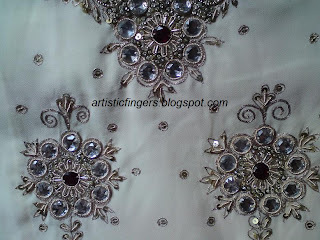 This Indian embroidery is a form of whitework embroidery .It is believed that earlier this embroidery was popular in West bengal in India and only from 19th century it was practised in Uttar Pradesh especially in Lucknow and it was patronised by the Moghuls.Now this form of embroidery is widely known as Lucknowi chikankari.Earlier it was worked only on white fabric with white threads.Like all the other embroidery even this has changed,now we use white threads on white fabric,colour threads on white fabric,white threads on colour fabric ……. This embroidery is a combination of techniques –shadow work,pulled thread and surface embroidery. 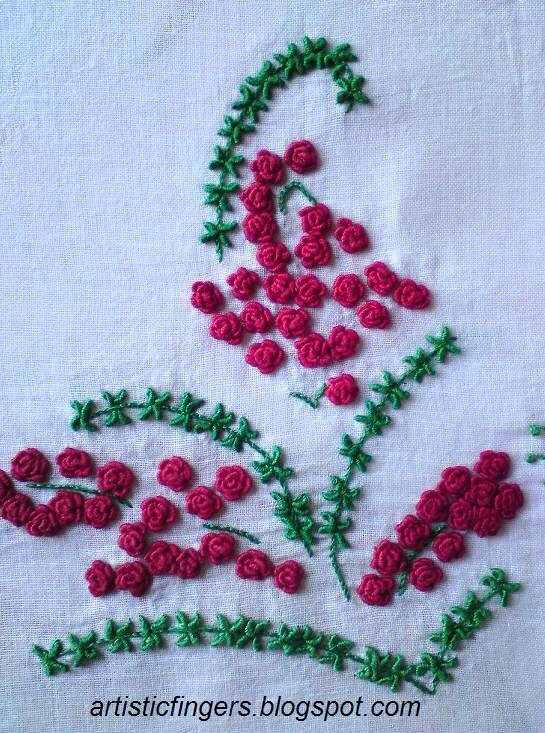 I’m going to show you how to stitch this.If you want to stitch along,you are welcome to join me. 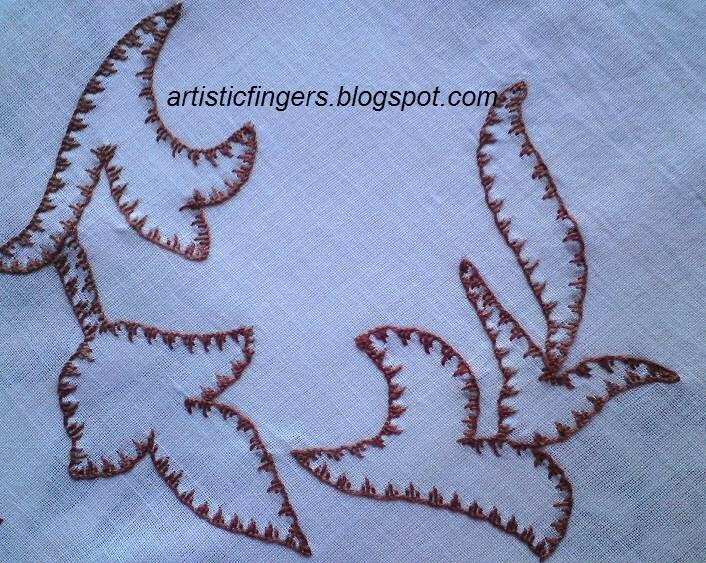 Please note that we will not stitch the design from the image I’ve posted today. 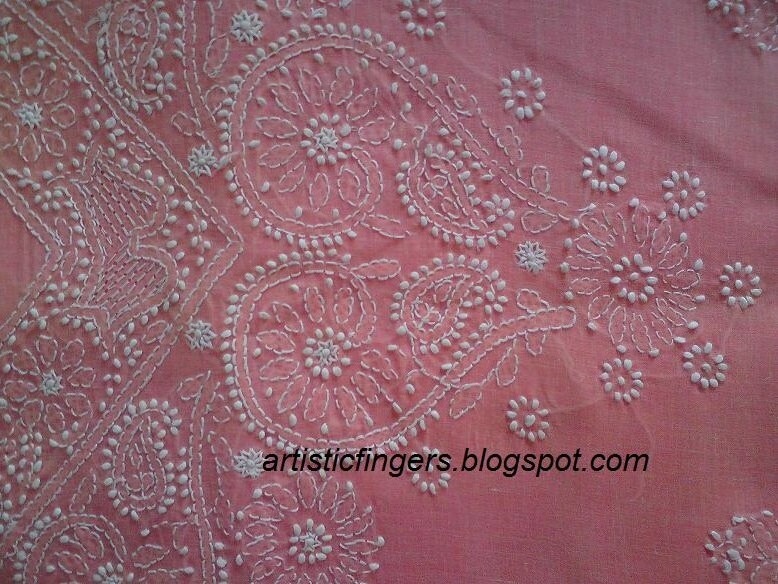 The design which I’m going to use is slightly based on a textile print which I’d seen on my mom’s old saree. You don't have to buy a kit or any material from me.I'm sure everyone will have the materials required in your stash. I’ll be posting a lesson every week.It’ll be a 6 – 8 weeks class.So if you want to join me please do send me a mail (mention your country,if India your city,town…. 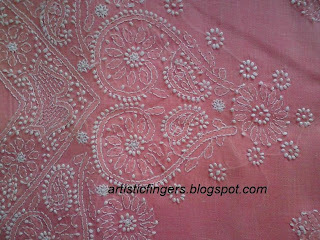 ).I’ll mail you the required materials list and design .Let’s start stitching as soon as you collect everything ,maybe two weeks from now.Feel free to write your suggestions.One of you had asked me about the cost,it’s completely free. You don’t have to pay me for the classes. 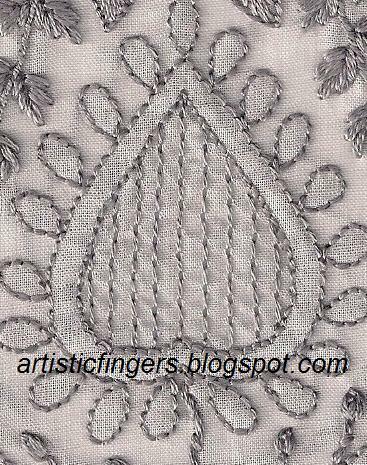 If you are planning to post your progress in your blog,then please do link back.If you want my feedback as we progress,you can mail an image of your embroidery piece to me. If you have any questions,then send me an e-mail . 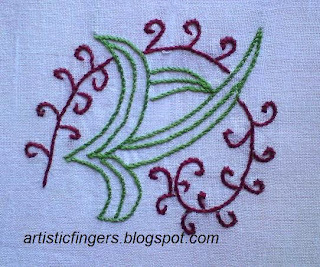 Many of you have visited my blog for Indian embroidery,some have decided to follow my blog ,so this class is for you .Thank you for the support. I’ve updated on 10th February and again on 12th February, but some of you didn’t read that post I guess. I’m sorry this time. If you’d sent me an e-mail I’d informed you already. But some of you are still leaving comments in this post, so I thought to put an update in this post too. Step 1 – Place the mirror on the fabric,draw the outline of the mirror and remove it.Work a circle of chain stitches outside the outline of the mirror.Bring the needle and thread inside the chain circle as shown in the image. Note:Do not pierce the fabric while working blanket stitches. 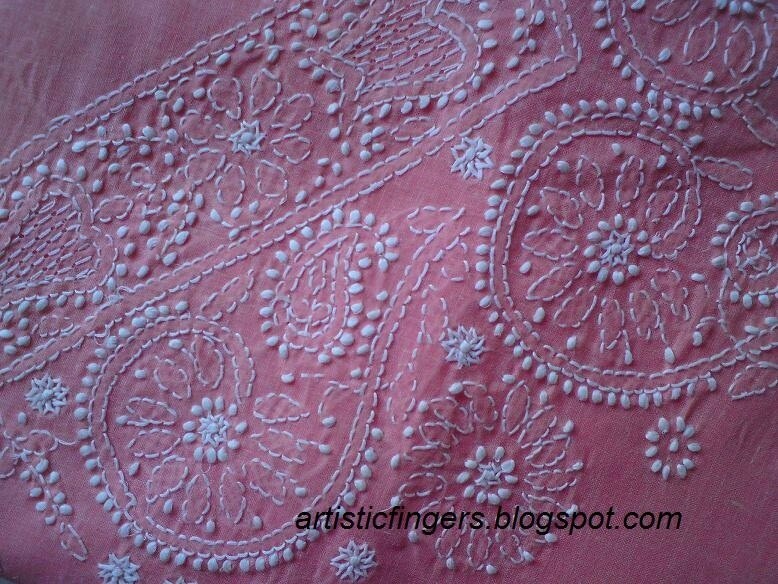 Step 3 – Whip through the threads between the blanket stitches. A close up image to show how to whip the thread between two blanket stitches. Step 4 – Place the mirror inside the circle. 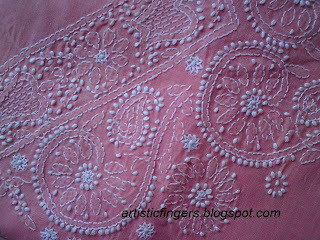 Step 5 – Pull the working thread little tightly so that the detached blanket stitches cover the edge of the mirror. 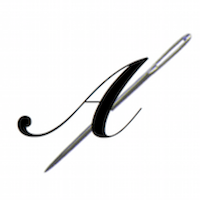 Step 6 – Press the mirror and the pulled thread with your thumb so that the thread doesn't go back to the original position and make a knot by passing the through the first detached blanket stitch made,pull the needle to form a small loop, pass the needle through the loop and pull it tightly. Go down at the closest point to the knot,whip through few stitches at the back and fasten off the thread. If you have any questions please do leave a comment or e-mail me.